Late last year, Motorola announced the Command One Bluetooth headset which sports a rapid recharging technology and a companion Android app. It does not look as futuristic as the Jabra Stone2 or as fashionable as the Jawbone Icon, but this headset offers a robust set of features in a traditional-looking form factor. With laws in states such as California requiring the use of hands-free accessories for placing calls on the road, it is always a good time to have a reliable brand-name solution such as the Motorola Command One on hand. After a full charge, I flipped the power switch on. The Motorola Command One begins speaking to you with audible instructions. These direct the user to head to the Bluetooth settings page on your device. While most new devices such as smart phones or tablets do not require a pin code, it mentions trying 0000 if needed. I got it paired to the brand new Android-powered Kyocera Echo without any issues. I was glad to find that getting this headset paired is a hassle-free experience. Unlike older complicated solutions, users do not need to hold down multiple buttons to get the device into a pairing mode. Just flip the power button and the Command One walks you through the entire configuration process. If you happen to have more than one phone, this headset supports multi-point pairing for staying connected to two devices simultaneously. Although it can not bridge two calls together, it can place one on hold while you answer an incoming call from a second device. To ensure a snug fit, Motorola includes five silicone ear pieces each varying in size. Paired together with the ear hook, the Command One stays put even with sudden movements. 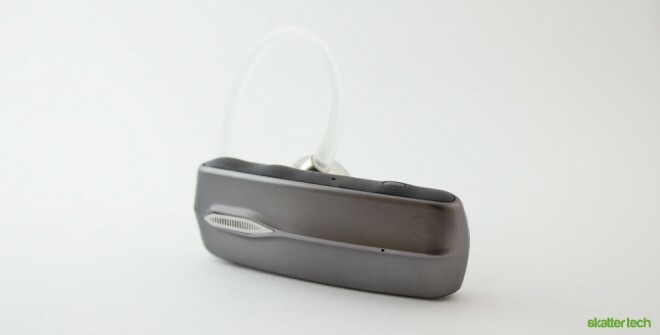 The headset flips to easily fit either the left or right ear, which lets users pick a preference. I found a comfortable fit, but keep in mind that it may vary from person to person. The stylish metallic grille on the front face offers a neat contrast to the dull chrome finish, but it unfortunately fell off after just two hours of use. That is not a good sign for an expensive accessory which should last for a few years. To be fair, that piece was just a sticker for style and the rest of the build quality was more robust. I was also glad to find the front face warding of fingerprints and that the glossy black coat on the inside is hidden from sight. A physical switch makes it easy to power the headset off when not in use. The opposite side features easily accessible volume rocker and a mute key. The talk button is awkwardly placed towards the end of the device surrounding the micro USB port. Pushing it launches voice commands, answers a call, or ends an in-progress conversation. It too me a few tries to get comfortable with the positioning, but it is not an issue after a few days in use. 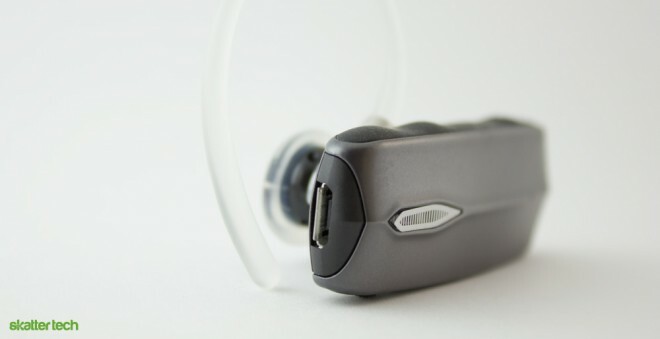 Motorola boasts its CrystalTalk technology which takes advantage of dual microphones to provide noise cancellation. Unfortunately, I was let hoping for more after testing the headset in various situations including a loud restaurant lobby, a moving car, and a quiet room. While the Command One works perfectly in silent areas, it only provides minimal background noise reduction. CrystalTalk does make it easier for the caller on the other end to hear you, but it does not do enough. Other solutions such as Jawbone’s NoiseAssasin technology do much better and almost entirely eliminates external sounds. As for hearing the person on the other end, the speaker in this headset is loud and clear. In fact, it can get quite loud if pushed to peak levels. It is easy to hear a conversation even in loud environments, but I just wish the experience was as good the other way around too. Although entirely compatible with iOS devices and just about any Bluetooth-enabled gadget, Motorola offers extra features for Android users with a MotoSpeak app. Once installed, users can hear a text-to-voice read out of incoming text messages and reply to them without having to touch your smart phone. Although a bit skeptical about voice recognition at first, I am glad to report that it was pretty accurate. I also loved that users can simply say “answer” or “ignore” after the Command One reads out the number of the incoming call. This eliminates even having to reach to your ear to click the multi-function key. For those wondering, I got about 4 hours of talk time out of the headset. Taking into account that I left the Command One on for nearly two entire days, I do not doubt Motorola’s official 5 hour talk time claim. I was also excited to learn that there is a built-in rapid charge feature which provides about 2.5 hours of talk time after plugging in for just 15 minutes. The Command One even reads out the battery level to ensure you always have enough power. For those looking for a new Bluetooth headset, the Command One should definitely be an option. It sports a traditional look for business environments and provides plenty of talk time. When it comes to audio quality, Motorola still has some work to do. I was glad to find that pairing with voice-guided directions is quite easy and it might just let most users get away without having to flip a page of the instructions booklet. At a price tag of $129, this headset is quite expensive. Although available for around $100 if you shop around, it feels too unreasonable considering that it lacks any unique features which would set it apart from competition.